By the first decade of the 1900s, smaller snare drum sizes were fast becoming the norm for use in popular music. These lighter musical styles, which would one day evolve into jazz and eventually morph into rock and roll, called for brighter sounding instruments than the military music of earlier days which utilized drums so regularly. By the 1920s, fourteen inches had become the most common snare drum diameter with fifteen inch drums being offered as an alternative for larger performance settings. Drums intended for classical and popular music generally ranged from about 3" to 8" in depth. The military instruments of the previous century were typically 16" or larger in diameter and much deeper. While the 14" diameter ultimately proved to be the most widely accepted because of its versatility, 15" drums were offered by many makers through the mid 20th century as "band" drums generally intended for large concert bands and symphony orchestras, and on instruments produced for use with marching bands and drum and bugle corps. The comparatively minute diameter of 13" may be a common size for piccolo snare drums today (with still smaller options available for special effects), but this was a very small instrument in relation to the other professional level offerings circa 1900 - 1920. Outside of toy drums or instruments intended for children, drums smaller than 14" were not typical. On the very edge of the size spectrum would be the 3" x 13" professional model as seen below. The newest addition to the collection is a Thumbscrew Rod Orchestra Drum by Boston's Nokes & Nicolai dating from about 1912. This particular piece comes from dry climate and is quite well preserved with no significant damage to the wooden components. The shell is solid steam bent maple, complete with original rosewood grommet. What is atypical about this drum for Nokes & Nicolai is the original 'Mahogany' finish which is clearly stained maple, not mahogany veneer. Nokes & Nicolai's catalog American Drummer No. 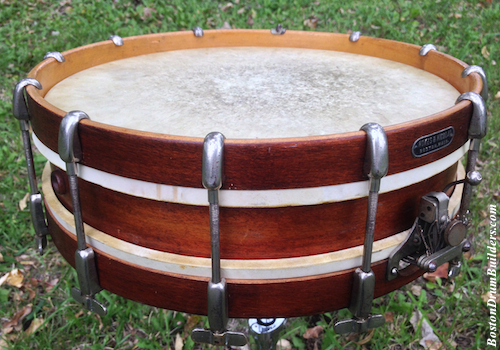 5 dating from the early to mid 1910s boasts "We can make any size or style Snare Drum from any material. NO VENEERS USED IN OUR DRUM SHELLS." Perhaps this stained finish was, at that time, the solution to a customer's request for a shell built from some material other than the commonly used maple. Nokes & Nicolai American Drummer No. 6 published circa 1918 claims "Solid Mahogany, Rosewood or Bird's-eye Maple shells add $1.50 to above prices" so it may be the case that different wooden shell materials were a later addition to the company's offerings. The 3" x 13" size is listed in both catalogs No. 5 and 6 with an even tinier 2" x 13" offered in the earlier catalog but not in the later. The most intriguing thing about this drum is the label inside. 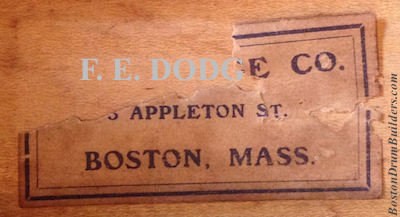 While partially missing, the label clearly read "F. E. DODGE CO. / 3 APPLETON ST. / BOSTON, MASS." 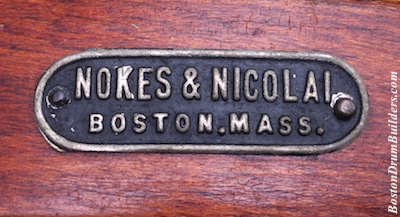 The badge affixed to the top hoop, however, reads NOKES & NICOLAI / BOSTON, MASS." So it would appear that this instrument dates to right around the time when the company was handed off from F. E. Dodge to Nokes & Nicolai in 1912 making this something of a transition drum. Do you have an instrument made by Nokes & Nicolai or F. E. Dodge? I'd like to hear from you! Feel free to send Lee an email at lee@vinson.net. And for more on Nokes & Nicolai and their predecessors F. E. Dodge, please visit BostonDrumBuilders.com.